Hi. First of all I am in awe of this huge movement of women who support community organizations and initiatives. When women come together, look out, I tell you! Every year that I age, I recognize the power of women more and more. Amazing. In summation, your commitment is fantastic and we are all overwhelmed by your generosity. 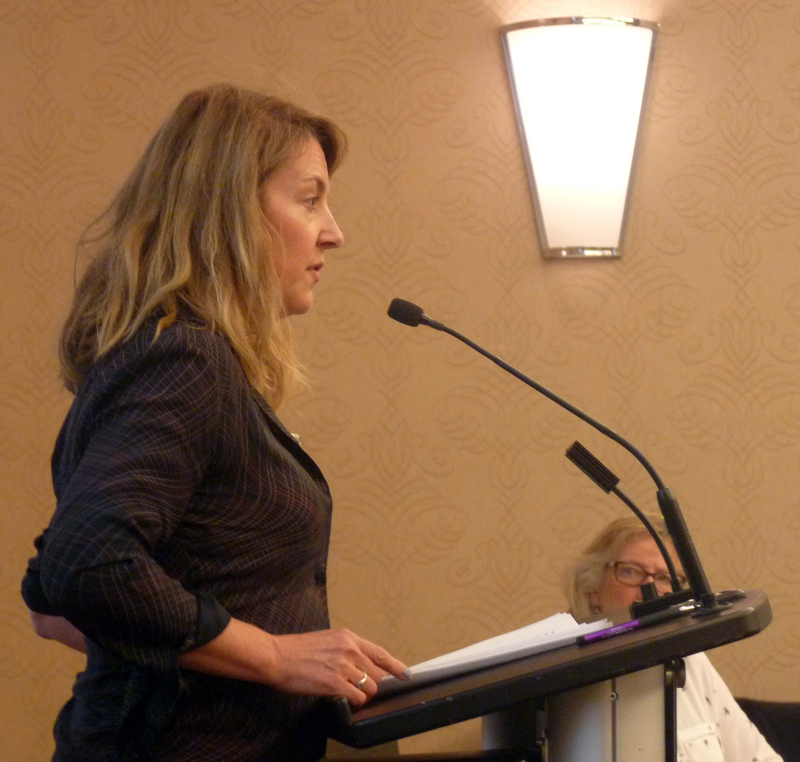 My name is Dawn Matheson and I am a past board member of Ed Video and I am currently a working artist who has been involved in a number of outreach and production projects with Ed Video over the last decade and a half. Just at this moment I am producing five videos in partnership with Ed Video, The Guelph Film Festival and Guelph Museum called Transported: Objects of Significance and the Immigrant Experience—the objects themselves are to be displayed in the museum screened alongside the videos that tell the stories of the objects and the people who treasure them. I’m also researching how to get more people in to Ed Video making videos- people living with disability and difference, and especially those in the Deaf community whose language is visual, where video is a natural medium. For nearly 20 years I’ve been producing video with community members in Guelph beginning with my first workshop on documentary production in my 20s at Ed Video where a group of us went on to record over 70 interviews with long term Guelph residents- seniors- who shared their lived experiences in our town, now used and stored as a valued digital archive of everyday life in Guelph’s history. I was asked to speak to you because I understand the value and importance of your donation to Ed Video. As someone who works in the arts and towards a more compassionate understanding and accepting society through art production and community collaboration, funds are not easy to come by. Art is not always awarded monetarily, and yet art is costly to produce. It takes skill, the labour of the artist, space to create, time, and the materials necessary to create— which brings me to your donation. I wasn’t involved in the acquisition of the equipment, but Liz and the Ed staff tell me that thanks to the generous donation from 100 Women Who Care, we have purchased filmmaking equipment that enables us to undertake multiple media projects including story production with and for Guelph’s Syrian refugee community. Our focus has been on providing a versatile selection of cameras, lights, and audio recording equipment that improves upon or augments Ed Video’s existing gear. We purchased two cameras: the Panasonic GH5 and G85, both easy to use but also capable of producing beautiful broadcast quality video and photos. We chose these cameras for their cutting edge features, and also because their acquisition provided us with a matched set with our previous Panasonic GH4, allowing for multi-camera shoots. These cameras are supported with multiple new lenses, making our collection well-rounded and higher quality. We purchased multiple lights to fit various situations, a versatile three-light kit ideal for both interview and narrative style filmmaking, a powerful battery-powered light that can be used for portable filmmaking, and a small easy to use light kit for emerging filmmakers. We have added a pro-level audio recorder that is simple enough for anyone to operate. With this project, participants can record great sounding audio and conduct multi-person interviews. 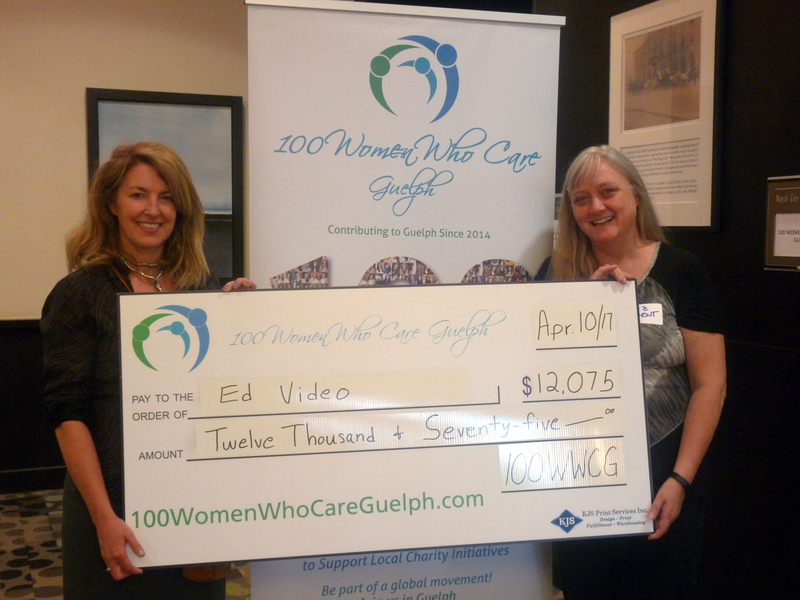 Liz Dent, director of Ed Video and Interdisciplinary Artist Dawn Matheson pose with a big cheque which represents the April donation from 100WWCG! To bring all of this great gear together we have purchased a selection of microphones, tripods, stands, and a selection of other supporting technical equipment. We have additionally upgraded one of our computers so projects can be edited with ease. This array of equipment purchased makes a great impact to what we are able to provide, and whom we are able to support. Your funds have given us the means to support our refugee community in creating and telling meaningful stories, and the tools to produce work that helps them to connect with the local and greater community. The extended network of Ed Video members and artists and creatives in Guelph and surrounding areas will also benefit greatly. Ed Video knows that just having equipment, while it is critical for work to be produced, it isn’t the only piece, or maybe not even the part you are interested in. It does take engaging the right video artists, the subjects and the time to set up production. And the third is a project engaging a local Guelph- Syrian woman to act as interpreter and to aid individuals on a one- to one basis in telling their stories of migration. Her preference is to do this individually and we’ve followed her lead: taking an approach that is sensitive to how different cultures work and how they wish to be represented. It’s a slow process to start, but I can attest that these production projects can make a huge difference to the participants’ lives. It takes a long time to create and produce video especially where we are looking at skill development and relationships and most importantly, building trust. Work done right with mutual respect and empowerment might take a year or two in development. So, with this in mind, Ed video doesn’t yet have any videos to show you tonight. To give you a sense of the work Ed Video does- Liz has asked me to take a few minutes to tell you about one of the projects I am currently working on as Lead Artist in partnership with Art Gallery of Guelph and Ed Video. The project began a year ago and will continue on to a Phase Two beginning next spring. In A Sense of Wonder I partnered with Deaf youth and kids with hearing loss (ages 8 to 22) in Guelph and throughout Ontario engaging with multimedia, performance, and video in an effort to provide access and insight into d/Deaf arts – what was really an exploration of the presence of deafness over the absence of sound. This was done through multiple experiential workshops where the participants led the content- they decided what interested them and how they wanted to express themselves and share their world. Four successful workshopped projects from A Sense of Wonder were just installed as videos by myself and Ed Video at The Art Gallery of Guelph and downtown at 10 Carden in a window projection across for City Hall for four Months. The long-term goal is for the Wonder troupe of children to be empowered artistically, socially and culturally, to build a future of personal narrative, a sense of owning story and representation and possibility, and to collaborate on a deeper level across differences and ages to address barriers to inclusion for everyone through the experience of art-making. Much the same as the goals of Ed Video. Ed Video will be working hard to create the same kind of links to the refugee community in future productions, thanks to all of you. In closing I just want to thank you again for your kind donation and assure you that your money will have an impact at Ed Video for many years to come. This entry was posted in Chosen Charities say Thanks on July 11, 2017 by Miriam Vince.